ISLAMABAD, Pakistan (CNN) -- A former Taliban commander who recently defected to the government was killed Tuesday morning in northern Pakistan after a gunman fired into a residence where he was sleeping, police said. Residents sift through the rubble of a bombed school near Peshawar. Qari Zain Ud Din Mehsud was an ally of Pakistani Taliban chief Baitullah Mehsud before his defection last week. The Pakistani military has been conducting an offensive against the Taliban, centered in the Swat region of North-West Frontier Province, and the defection of Qari Zain Ud Din Mehsud was seen as a major coup in the army's fight against the militants. His death is expected to weaken the resolve of any other tribal leaders wanting to join the government. The attack took place about 6 a.m. in the city of Dera Ismail Khan, according to Ghulam Rabbani, head constable. A colleague of Qari Zain Ud Din Mehsud was injured in the shooting. In separate incidents, U.S. drone attacks killed at least 40 people, including a Taliban commander known as "Sangeen Khan," according to Pakistani intelligence sources. In the first incident, a drone fired three missiles into a stronghold of a Taliban chief -- it was not clear if it was Khan -- killing two people and injuring several others. 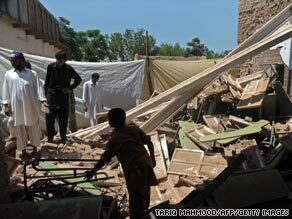 The missiles hit a training camp in tehsil Ladha. The second drone attack targeted the funeral prayer in Makeen for the people killed in the first attack. The Pakistani intelligence sources also said the Pakistani military was carrying out airstrikes in South Waziristan in retaliation for Qari Zain Ud Din Mehsud's killing. A day earlier, a Pakistani military source said airstrikes had killed 20 Taliban militants over the 24 hours ending Monday morning, a military source said. The airstrikes were launched in the village of Charmang, as part of an attempt to retake small pockets of Bajaur Agency, according to the source. CNN could not confirm the casualties because of access and safety reasons. The operation is going on in North and South Waziristan, the source added, particularly to clear supply routes and prepare for a major operation against Baitullah Mehsud, who has ties to al Qaeda. Also Monday, a police officer and two civilians were killed when a suicide bomber drove an explosives-laden vehicle into a police checkpoint near Peshawar. Early Sunday, a bomb destroyed a girls school east of Peshawar, authorities said. No one was in the school at the time, but two people who live in houses near the school suffered minor injuries.